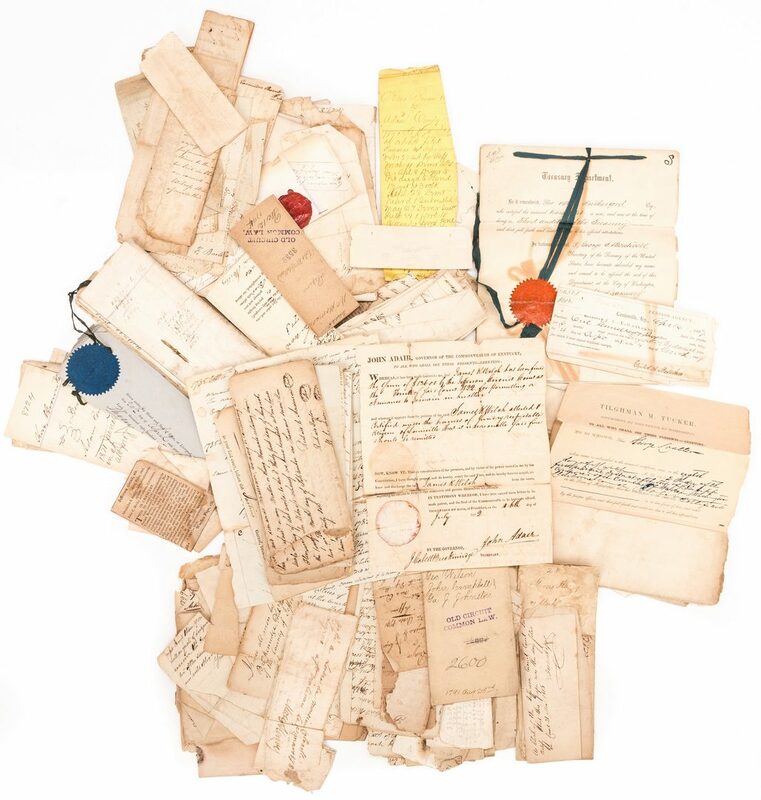 Archive of mostly Kentucky related documents, including legal documents related to early Jefferson County settler Richard Chenoweth (who lost several family members and whose wife was scalped in the notorious Chenoweth Massacre of 1789), plus documents bearing signatures of KY Governor John Adair and Mississippi Governor Tilghman M. Tucker, along with numerous other documents, about 60 total. 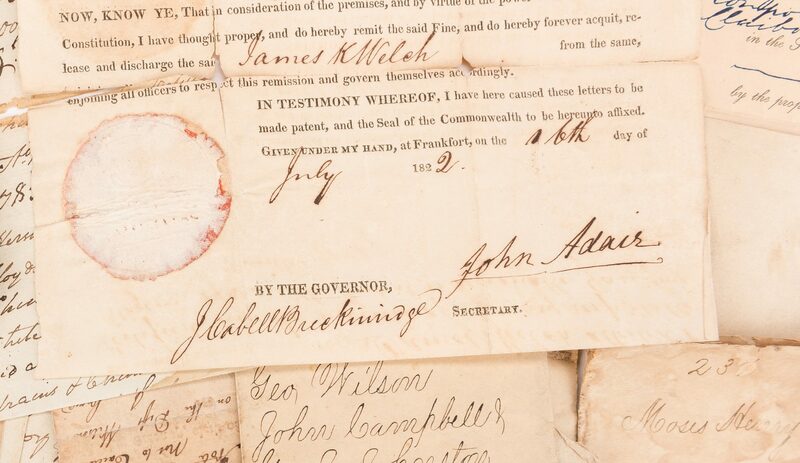 The archive includes an 1822 acquittal signed by Governor John Adair in the case of James K. Welch, who was fined $136 by the Jefferson Circuit Court "for permitting a nuisance to remain in his cellar". 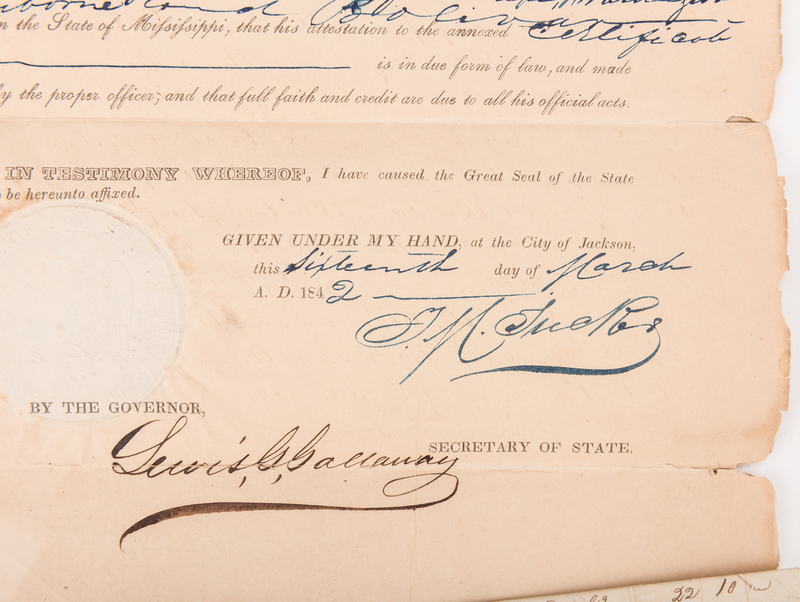 Counter signed by J. Cabell Breckenridge, Secretary, and Worden Pope, clerk. 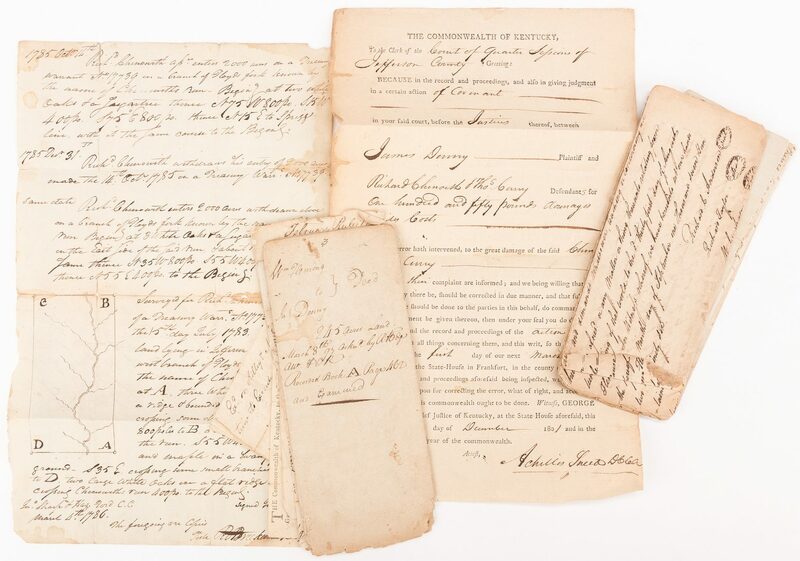 Also included is an 1869 Civil War pension application and reciept for Elizabeth Mitchell, widow of Union Lt. Col. Samuel Mitchell. 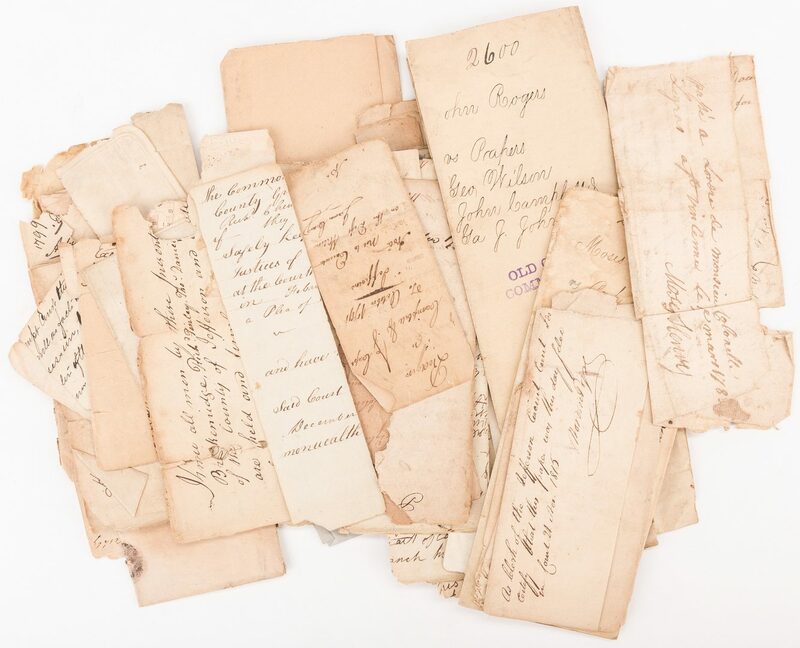 The dozen or so Chenoweth documents appear to be related to a 1797-1801 court case involving Chenoweth (1735-1802) and Thomas Curry vs. James Denny (Denney). 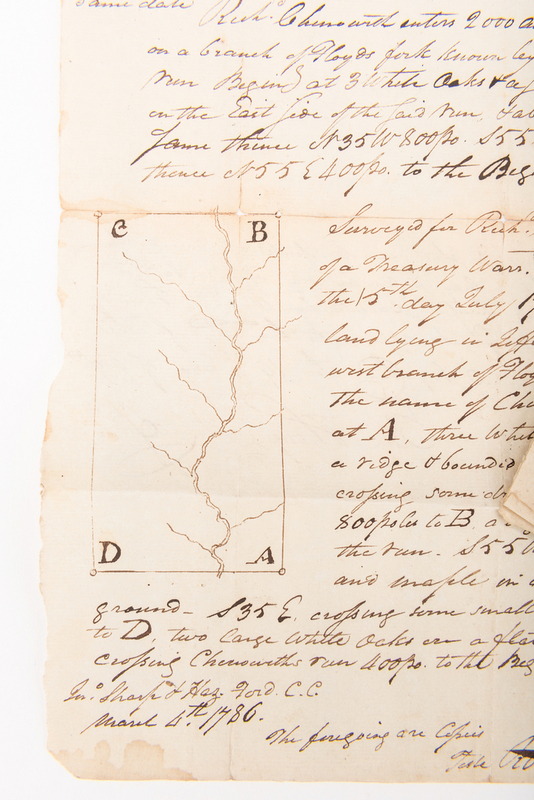 They include a manuscript copy of a land survey for Chenoweth, dated 1783-1785, with hand drawn map, for 2000 acres in Jefferson County along the west branch of Floyd's Fork; and an 1801 Kentucky Court of Appeals judgement in a court case finding "manifest error has occurred to the great damage of the said [Richard] Chenoweth and [Thomas] Curry", defendants in the case brought by James Denny over a land dispute, ordering the error "should be corrected in due manner and that full and speedy justice should be done to the parties in this behalf". 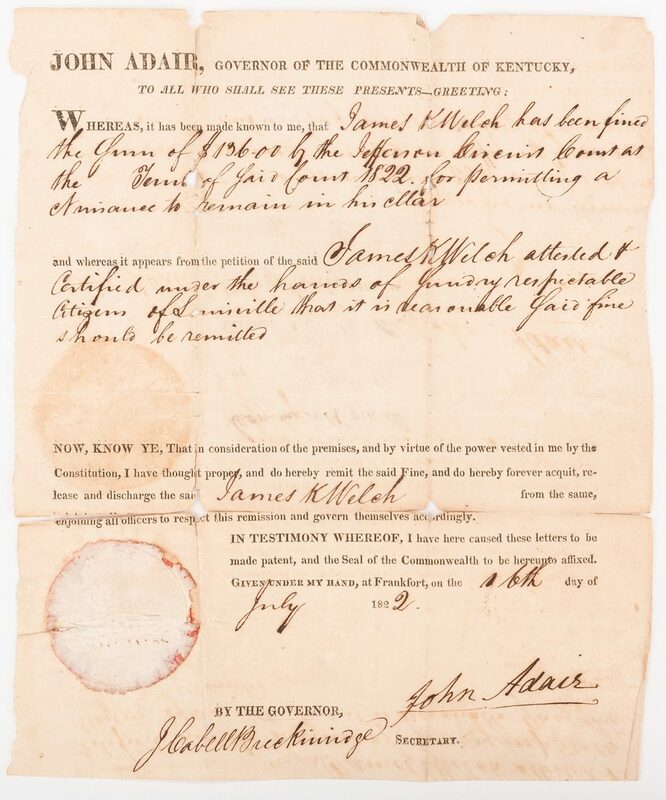 The order is signed by Achilles Sneed, clerk of the Court of Appeals from 1801 until he was ousted in 1824 as a result of the Old Court-New Court controversy. (In that controversy, the Kentucky General Assembly abolished the Kentucky Court of Appeals, the state's highest court at that time, and replaced it with a new court. The justices refused to recognize the validity of that action, and for a time, two separate courts operated as the court of last resort in Kentucky, pushing the state to the brink of Civil War. Sneed refused a legislative mandate to turn over his records to the New Court by January 1825, so Francis Blair, the New Court clerk, assembled a group that broke into Sneed's office and took what records they could find; Sneed was subsequently charged with contempt of court). 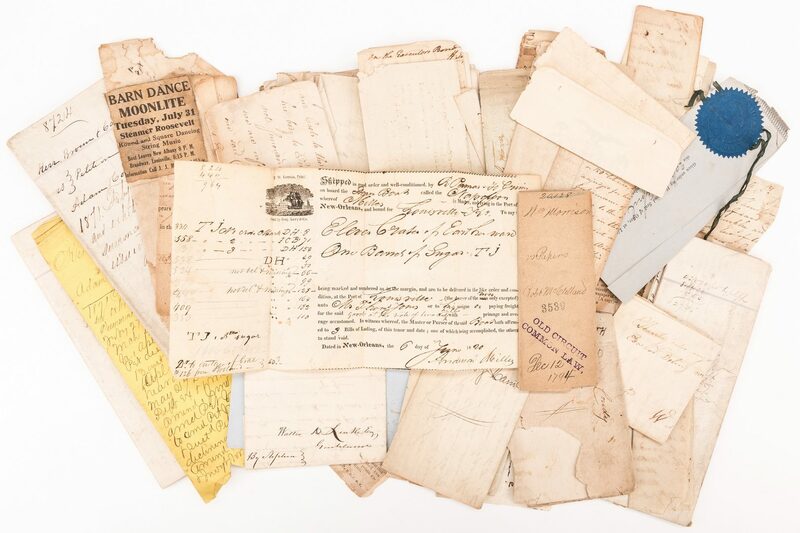 This archive also includes numerous other documents related to court cases from 1785 through 1871 and some documents from Mississippi, Maryland and Louisiana (including one signed by New Orleans mayor William Freret in 1841), a marriage certification for William Wisehart and Mary Hines of Hamilton County, Ohio, signed by Peter Bell; and a freight receipt for wares (including sugar and earthenware) transported between New Orleans and Louisville. 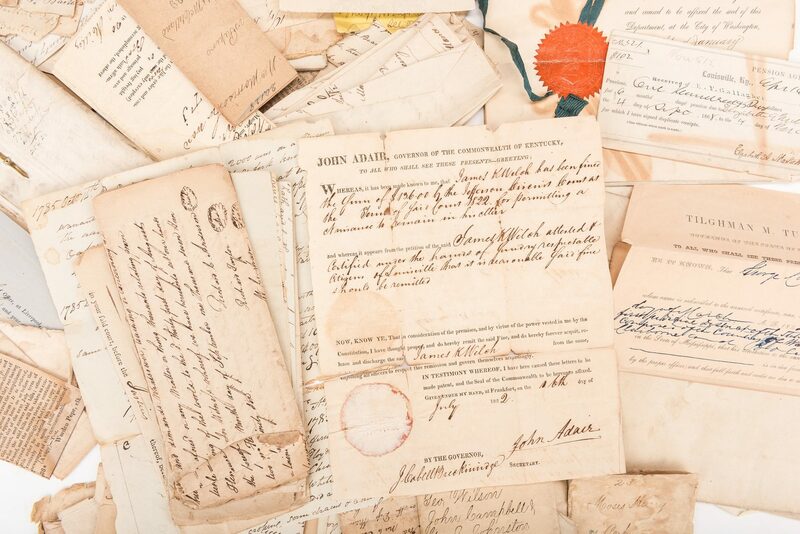 Note that one document bears a 20th century purple stamp "Old Circuit Common Law". 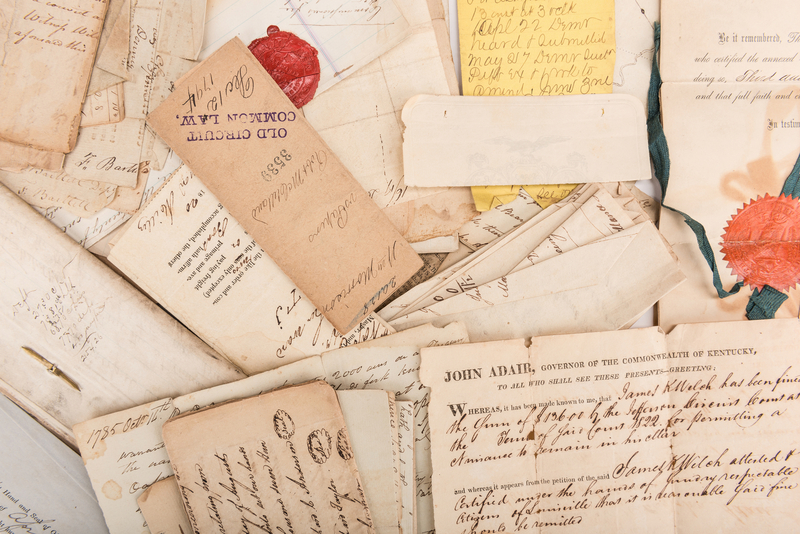 Some of the documents, including one with "signatures" of Richard Chenoweth and wife Margaret, appear to be old manuscript copies. 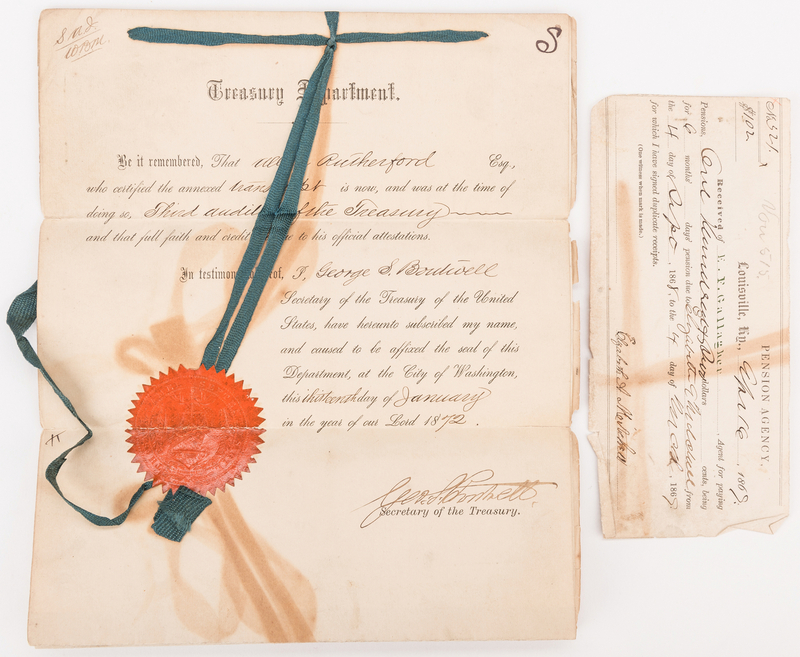 CONDITION: Most documents are toned and fragile, with separations at fold lines ranging from 1/4" to full separations. 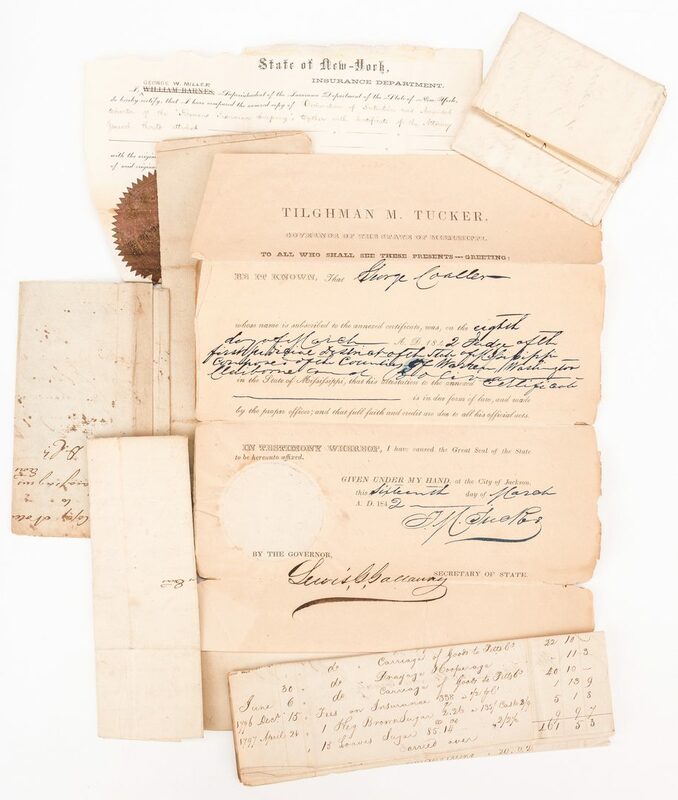 Tucker, Roman, Freret and Adair documents have fold separations but unaffected bold signatures. The Chenoweth land survey document has stains to entire right edge. Note that one group of documents is extremely fragile, and contains several fragments.